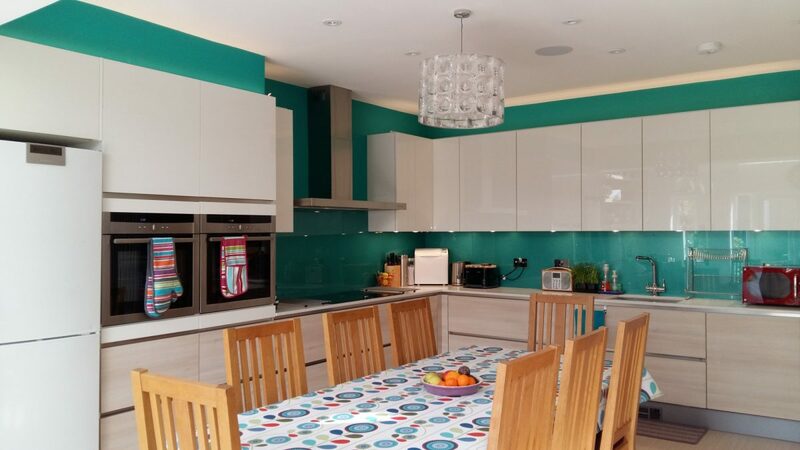 Modern Handleless Kitchen With Stand Out Aqua Green Backing. 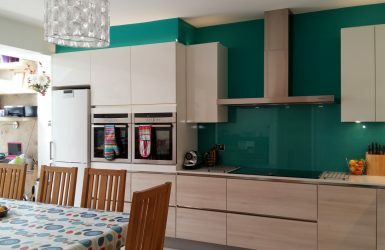 “We had, we thought, a very simple design, and a clear idea of the look we wanted, white handleless gloss plus an accent. Jane guided us through the process, during which we learned many things, including the fact that no design is simple, and experience is paramount in getting the design right. Jane considered how we lived and cooked, our family and individual needs, space and efficiency in how we used our space. We were given John Lewis price matches on all the appliances that we needed to buy and free saucepans for our first ever induction hob! 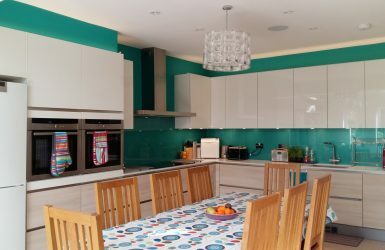 Jane was also able to advice us on lighting, cabinet interiors and ergonomics, as I have a very bad back and the result is a light and bright kitchen which works wonderfully – places for everything including my huge range of spices for Indian cooking, and really easy to cook in. 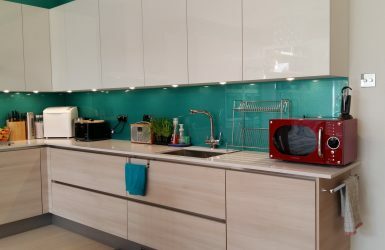 Most importantly, we needed a good extractor to ensure that the smell of cooking spices didn’t settle into soft furnishings in our kitchen diner. Jane was able to specify a custom built extractor for us from Falmec, which works like a dream!